David Pepper tries to laugh, tries to make sense of the fire that damaged about a third of ThorSport Racing’s shop on Monday, decimated its fab department and destroyed three of its Camping World Series trucks. What other damage is uncertain, the team’s general manager told NBC Sports in an exclusive interview Tuesday. The basement is under about 5 feet of water, and the shop floor is under about a foot of water. Nineteen fire units from four Ohio communities converged on the Sandusky shop Monday. The last crew didn’t leave until more than 16 hours after the initial call. No one was injured. Water flooded part of the ThorSport Racing shop after firefighters battled a blaze at the shop Monday. Despite the angst and uncertainty of what will happen next, Pepper tries to smile. Pepper admits the four-truck team faces many challenges in the coming days and months, but they will be at Iowa Speedway this weekend planning to win with either two-time series champ and current points leader Matt Crafton, Cameron Hayley, Rico Abreu or Ben Rhodes. When they arrive at Iowa, they’ll be greeted by fellow competitors offering assistance. Pepper said about five teams will bring equipment to help the team get through the weekend and beyond. Fire destroyed the fab shop and suspension room — where Pepper said the fire originated. All their suspension, driveline and brake components in that area were destroyed. The three trucks they lost were a speedway truck that ran at Daytona International Speedway, a new intermediate truck and a new road course chassis. Pepper estimated that 35-40 percent of the 100,000-square foot shop was lost. The Ohio State Fire Marshall’s office is investigating the cause of the fire. Bill Krugh, public information officer for the Ohio State Fire Marshall’s office, said that there is no timetable for when that will be finished. The team cannot work in the building because of the damage. “We are a race team without a home,’’ Pepper said. Each of ThorSport Racing’s four teams worked in the parking lot of a grocery store after Monday’s fire at the race shop.Their home Tuesday was the parking lot of a nearby Kroger grocery store. All four teams were there with their haulers and the trucks they’ll race this weekend. Pepper said local restaurants have helped, bringing the team food and drinks. He noted one woman no one knew brought the team cookies. For all that was lost, some items were rescued. Those trucks will not return to the shop anytime soon. Pepper said the team is looking for a place to work. The plan is to stay in Sandusky. Although teams in the Charlotte, North Carolina, area offered space in their shop for the team to work, Pepper said team officials didn’t want to uproot their employees from their homes. One option for the team is to relocate to the old Kroger location the grocery store recently left for its current spot near the shop. Pepper said he hopes that in six months they can be working in about half the race shop but there’s much that must be done. Smoke damage, along with the water and fire damage will take time to repair. Some walls buckled after an excavator ripped a side of the building down so firefighters could combat the blaze, which had gone through the wall to the roof. “If I wouldn’t have done that, we would have probably lost the entire building,” Capt. Jim Johnson of the Perkins Township Fire Department in Sandusky, Ohio, told NBC Sports. Even more difficult than rebuilding will be for the organization to work through the coming weeks. “The shock of it hasn’t set in,’’ Pepper said. “We’re working over in a parking lot. It’s not going to be so dissimilar when we go to Iowa and we work out of the back of the haulers. 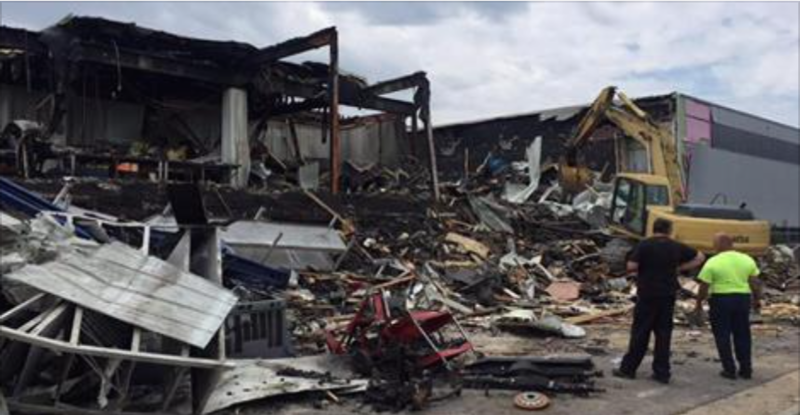 Shop floor at ThorSport Racing after a fire there on Monday. That can wear on emotions for all. Yet, as they do that, Pepper and the rest of the organization can’t escape the realty of their situation. The scene became more poignant for Pepper when he pulled around the back of the building. “I’m looking at a bulldozer throwing stuff into a 53-foot dumpster,’’ he said. “I just watched a little while ago them lift a pile of rubble up and it’s got a bunch of pictures that were in the back hallway. All going into a dumpster. They’re all half burned up.